[163 Pages Report] The distributed generation market was USD 54.26 Billion in 2016 and is expected to grow at a CAGR of 11.48% from 2017 to 2022 to reach a market size of USD 103.38 Billion by 2022. This growth can be attributed to the increased global demand for electricity, decreasing costs of solar technology, and rising efforts to reduce global greenhouse gas emissions. The market is segmented by application, technology, end-user, and region. This research study involved the use of extensive secondary sources, directories, and databases, such as Hoover’s, Bloomberg Businessweek, Factiva, and OneSource, to identify and collect information useful for a technical, market-oriented, and commercial study of the distributed generation market. Primary sources are mainly industry experts from the core and related industries, preferred suppliers, manufacturers, distributors, service providers, technology developers, standard and certification organizations of companies, and organizations related to all the segments of this industry’s value chain. The points given below explain the research methodology. After arriving at the overall market size, the total market has been split into several segments and sub-segments. The figure given below illustrates the breakdown of primaries conducted during the research study on the basis of company type, designation, and region. Distributed generation refers to power generation at the point of consumption. The distributed generation market starts with the manufacturing of basic components of distributed power technologies which include turbines, engines, solar panels, combustion chambers, motors, and catalyst layers. In the later stage, the assembling of distributed generation technologies takes place where all the components are integrated. These equipment are then distributed to various industrial, commercial, and residential end-users where they are commissioned. The leading players in the distributed generation industry include Siemens (Germany), GE (US), Schneider (France), Mitsubishi (Japan), Doosan (South Korea), and Capstone (US). 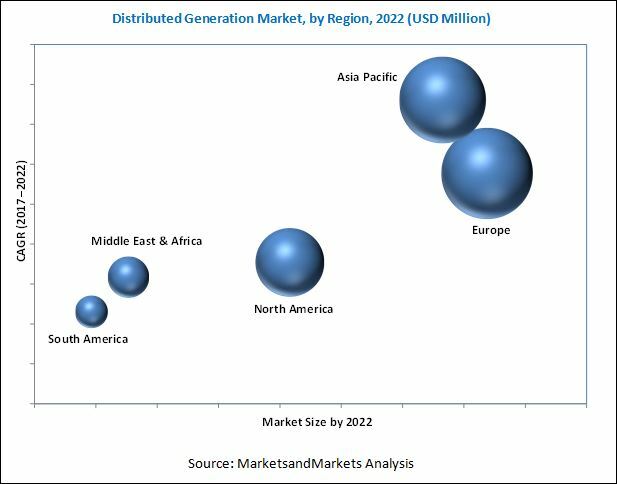 The distributed generation market is projected to reach a market size of USD 60.04 Billion in 2017 and is expected to grow at a CAGR of 11.48% from 2017 to 2022. The growing demand for electric power accompanied with regulatory incentives for clean energy generation have shifted the focus toward distributed generation technologies. The report segments the distributed generation market, on the basis of application, into on-grid and off-grid systems. The on-grid segment led the market in 2016. Grid-connected installations are largely used as a long-term investment to provide energy for local loads and for the exchange of power with utility grids. These are used for power generation by various end-users including industries and manufacturing applications. 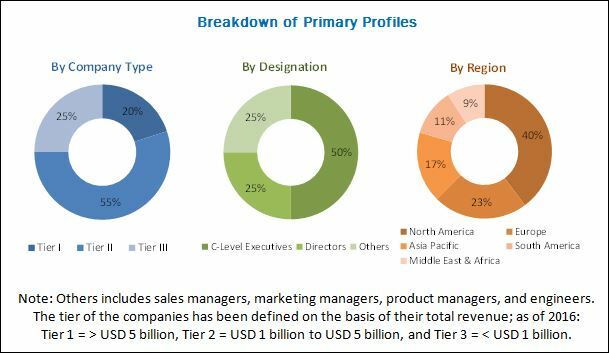 The global distributed generation market, by technology, is segmented into solar PV, wind, microturbines, reciprocating engines, fuel cells, and gas turbines, of which, solar PV is the fastest growing segment. The decreasing costs of solar installations, attractive incentives, and greenhouse gas emission restrictions are expected to drive the adoption of solar PV technology for power generation during the forecast period. The report further segments the distributed generation market, by end-user into industrial, commercial, and residential segments. The commercial segment of distributed generation is expected to grow at the highest CAGR during the forecast period. Government initiatives toward green solutions, the growing demand for reliable power, and easy availability of fuel are expected to drive the growth of the global market during the forecast period. In this report, the market has been analyzed with respect to six regions, namely, North America, Europe, Asia Pacific, South America, the Middle East, and Africa. Europe is expected to dominate the distributed generation market during the forecast period, owing to the continued increase in energy consumption mainly from by the industrial and commercial sectors, which contributed to the largest demand for distributed generation. The demands from the IT and telecommunication sectors are also driving the market. The figure given below shows the market size of the year 2022 in various regions, with the respective CAGRs. The major factor restraining the growth of the distributed generation market is the reluctance to spend on distributed generation technologies as it takes a lot of investments, effort, and time to alter and switch to decentralized business models which were earlier functioning in a traditional centralized way. Some of the leading players in the distributed generation market include Siemens (Germany), GE (US), Schneider (France), Mitsubishi (Japan), and Capstone (US). These players have adopted growth strategies such as new product launches, contracts & agreements, mergers & acquisitions, and expansions to capture a larger share in the market. *Details on Business Overview, Strength of Product Portfolio, Business Strategy Excellence, Recent Developments, MNM View might not be captured in case of unlisted companies.